Want To Learn More About Gel-X, the nail system that stars like Ariana Grande can’t get enough of? Check out a client’s thoughts about Gel-X below! The first time I visited Herbal Nail Bar I had just switched from acrylic nails to IBD Gel nails. My first appointment with Herbal Nail Bar was to fix a broken nail but of course, it was time for a fill for me. Don was kind enough to listen to me complain about how tired I was of having to have long fill appointments due to the IBD Gel system process. He provided me with a nail consultation. I had mentioned that I wish that my nails would be strong enough so that I can have natural nails. I was using acrylic tips for the past two years without letting my nails breathe. Don suggested that I try a new nail system, Gel-X by Aprés. Some points that he made that really stuck with me was that the fill-in process is much quicker, they last 3 weeks (versus your typical two weeks), they are all organic and would be much healthier for my nails. After doing my own research I decided to switch completely. I came in for a two-hour session with Don where he stripped off my old IBD Gel nails. My nails were long enough that he could shape them. I was looking for shorter nails which worked perfectly. We decided “almond” shape would be the best shape for me since I was looking for a shorter style that would elongate my fingers. Throughout the whole process, he was educating me on what he was doing and why he was using the tools that he was. It was an experience I’ve never had. I can tell he is very passionate about the quality and outcome of his work at his organic nail salon. This system provides the strength of acrylics but it is ultimately without the harsh chemicals and powder. This system is the next best system next to natural nails. Your nails will look and feel so natural. Many celebrity nail stylists are loving this system. Check out Ariana Grande’s nails…how natural do they look? She has been using the Gel-X by Aprés System since Spring 2018. Gel-X is the world’s first 100% soak-off soft gel extension system. They are soaked off versus having to be shaved down. I don’t know about you but that drilling noise drives me insane! If you are going to be using tips, they have clear gel tips that are already shaped! There is no dust, no odor or damage to your natural nails. I love that I can’t smell any foul or strong chemicals — the perfect addition to any organic nail salon! This is a nail enhancement revolution and is the best alternative to your acrylic nails or hard gel extension. Last up to three weeks (can vary on your natural nail growth). They are easy to use and apply for your experienced technician. When Don is working on my nails with the Gel-X system, he doesn’t even have to wear the usual mask to cover his mouth and nose. This is how safe this system is versus the other systems. What are you waiting for? 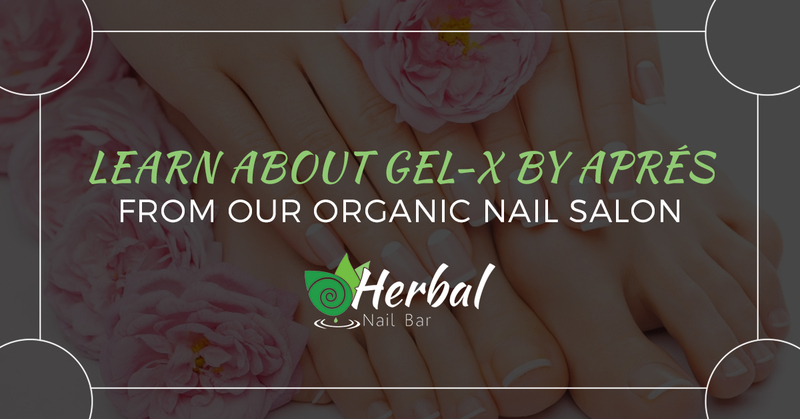 Visit Herbal Nail Bar for your Gel-X Aprés Nail set! You will love them and will see the difference between your old nails and your improvement. Schedule an appointment online for an organic nail service!